GSky Plant Systems has installed a beautiful 1226 sq. 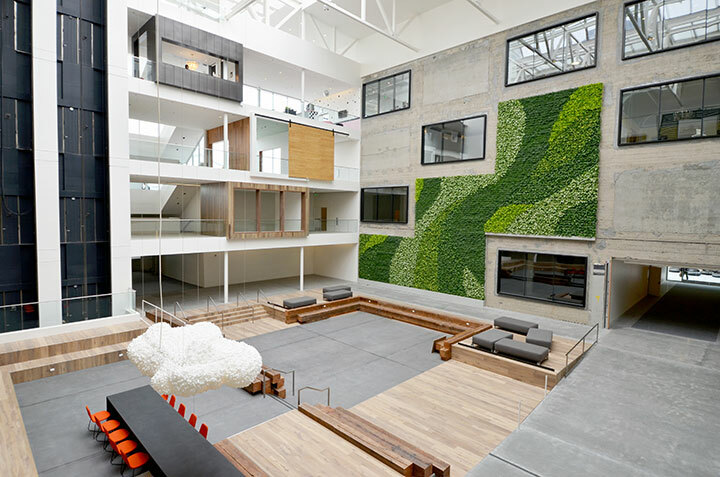 ft. living wall in the atrium of a five-story historic building, 888 Brannan. Located below a massive skylight, the verdant GSky green wall is an unprecedented living artwork that breathes life into the building. GSky’s design inspiration for this living wall came from the famous San Francisco hills that make up the city’s urban landscape. Painted with a unique palette of 7042 four-inch potted plants, the green wall is a well-balanced union of nature, art and history. As we spend less time outdoors, the more we become disconnected from the natural world that is essential for our emotional, physical and mental well-being. A living green wall is a great way to bring nature back into our lives, as well as life and harmony to human-made structures.